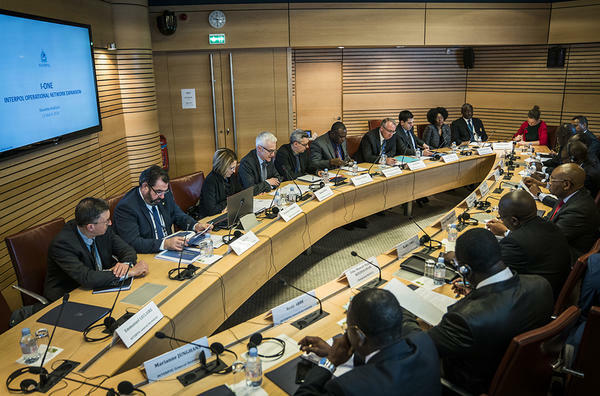 Africa’s regional police leaders and Secretary General Jürgen Stock have launched an INTERPOL initiative to strengthen Africa’s global law enforcement role by improving its ability to share and receive police information. The I-ONE launch provided an opportunity for the four African regional police chiefs and senior INTERPOL staff to emphasize the importance of empowering African National Central Bureaus (NCBs) so as to better tackle Africa’s crime challenges and security threats. The police chiefs, who also met with INTERPOL’s Heads of African Regional Bureaus, are the Chairs of Africa’s four regional police organizations: Central Africa (CAPCCO), East Africa (EAPCCO), Southern Africa (SARPCCO) and West Africa (WAPCCO). I-ONE will start in Africa with the modernization of 31 NCBs selected from all parts of Africa, providing them with new equipment so they can better use INTERPOL police services and capabilities. With border points serving as critical locations for detecting travelling criminals, I-ONE will help newly modernized NCBs give frontline police at airports, seaports and land border crossings access to INTERPOL’s secure global police communications network, I-24/7. This will provide them hands-on access to vital police information in INTERPOL’s databases, enabling them to instantaneously detect criminals or criminal activity. Secretary General Stock said the I-ONE initiative would ensure that well-equipped, well-trained African NCBs would help their national police forces tackle pan-African transnational crime. “I-ONE ensures that African police officers can work together, not only at regional level but across Africa, so that in the interest of regional and global security, no-one gets left behind,” said Secretary General Stock. “Equipment renewal will boost the use of INTERPOL services and in turn serve to increase contributions to INTERPOL databases with African police intelligence so critical to preventing terrorism, organized crime and cybercrime.” said EAPCCO Chair representative Fred Yiga. “With strong border security the first line of defense in preventing criminals from crossing borders, by improving NCB capacity, I-ONE is preparing the way for African NCBs to coordinate systematic and automated traveler screening,” said SARPCCO Chair Alfredo Eduardo Mingas. I-ONE is funded by an INTERPOL investment of EUR 2 million to modernize NCBs through IT equipment renewal and capacity building. The initiative not only seeks to strengthen NCBs individually but to create a stronger NCB network and more secure region, with the support of INTERPOL’s African Regional Bureaus. I-ONE will be implemented over 21 months (April 2018 ‒ December 2019) in 31 African countries that do not currently receive support from any other externally funded projects.